I first learned what a letter Journal is, "An envelope sized, hand made journal (little paper booklet) that gets sent around a small group while people add art to it." -from Jade Herriman. LJ's are small; about 4" wide by 8" tall. They fit into a business-size envelope to easily allow sending back & forth and collaborating in! I wanted to share a "Letter Journal" I collaborated on with a dear friend, Sharon Borsavage. 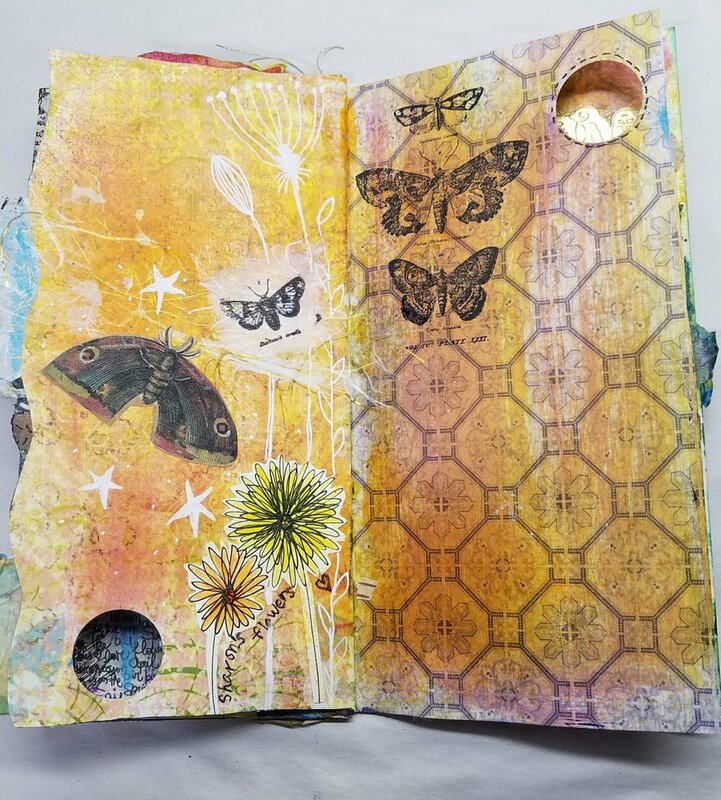 Letter Journals are described as: "An envelope sized, handmade journal (little paper booklet) that gets sent around a small group, while people add art to it." -by Jade Herriman; check the link for more! They're small; about 4"x8". They fit into a business-size envelope for easy sending back & forth. I love the format. Sharon and I started this exchange in late 2016. We took our time and did not put any pressure on to add to it by a certain date, letting our exchange happen organically. We originally planned to do more layers/another round, but after procrastinating to add more, I realized I was happy with my journal as it was! First I'll share the letter journal that I created and sent to Sharon. She added to it and sent it back to me. sharon added a real feather! Sharon adds: Spread Your Wings! Below are photos of Sharon's Letter Journal. I took photos after Sharon sent it to me, before I added to it. Then after I collaborated in Sharon's book & before I sent it back to her - I took photos again. There is room for Sharon to do more in her own Letter Journal herself & that’s great! Mail art to send it back! Thanks for looking At our Letter Journal. Collaborative art is one of my favorite things! Sharon and I also collaborated on 2 Altered Books . . .
* This Link will bring you to an album sharing both of our ART in Sharon's Altered Book. * The First Letter Journal I ever made (April 2016) is here on my blog!